Orestis Germanos, a squad member of the Limassol Nautical club, is a talented young sailor, who brings many promises for the future of Cyprus sailing. Even though he is still very young (born on March 10th, 2000) he has already showed aspects of his talent, in the local championships and internationally as well. Orestis Germanos was placed fourth in the U17 category out of 47 participants. The success story does not end here. He managed to enter the gold fleet, placing himself 18th overall (U19), with 138 participants. This particular success came in the Radial Youth Europeans Championships & Trophy 2016 staged in Tallinn Estonia, between the 9th and 14th of August 2016. On the occasion of this remarkable success, we had a conversation with the athlete. “I started in 2006 in Famagusta Nautical Club at the age of six years”. You obviously love the sport. With continuous training and matches, you do not feel deprived of what the other boys in your age enjoy? “Yes that is true, but I do not see it that way. An athlete who sets goals knows that he will be deprived of some things. I like what I do. I want to continue working hard to reach higher”. Do you have a general objective? “Yes I want to win a medal in a World event and therefore I will try”. You’re a student and are planning to study. Will you combine sports and studies? “Yes, I will try to do so. However I have not yet decided what field I will follow. I will decide on the way”. “Yes it helps. In principle the competition is more intense in such events and this improves me. Specifically, I collect experience on how to keep my place in the race. I also improve my experience in a fleet with many competitors. This does not happen in racing in Cyprus”. Have you got a “sailing model”? “Pavlos Kontides which I consider a great athlete. We talk often with Pavlos, I see that he believes in me. He advises and guides me on how to move on and become ever better. The contact that we maintain is useful”. What do you think about the sport of sailing to Cyprus? “There is a great effort from everyone involved in the sport for improvement. But it does not have the impact it deserves from the world. I hope this will become a reality in the near future”. Orestis Germanos was born on 10/03/2000. 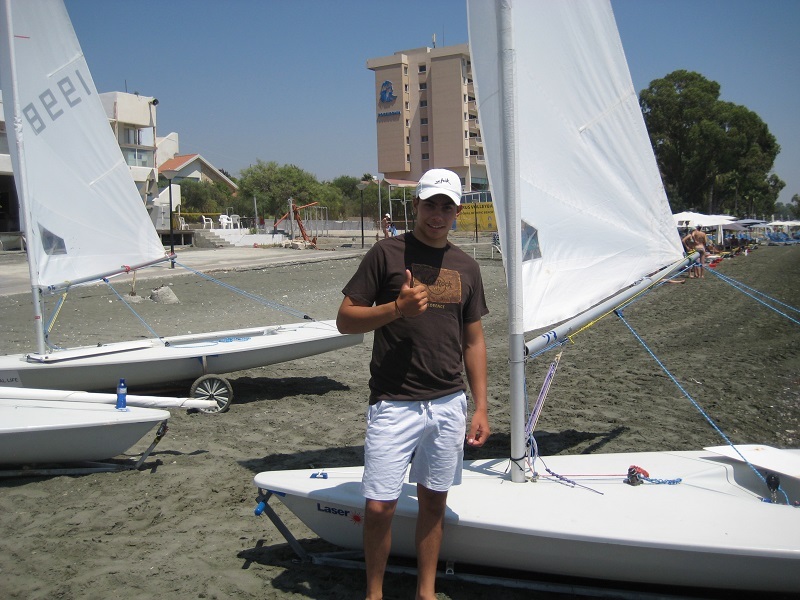 He made his first steps in sailing in 2006 in the Famagusta Nautical Club. He was a member of the national Optimist team from 2009 until 2011, before he moved to Laser in 2012. In November 2012 he was transferred to Limassol Nautical Club. He is a member of the national teams 4,7 Laser and Laser Radial. In July 2013 he represented Cyprus at the World ISAF Youth World Championship held in Cyprus in the 29er class, being the youngest member of the Cyprus national team. He took 42nd place out of 68 participants in the Laser Radial class in “ISAF Youth Sailing World Championship” held in Malaysia in December 2015. He was first of six athletes (U17) and ninth in total of 24 athletes (open participation) in Olympic sailing week held in Croatia in Split on April 2016. He finished second in the bronze fleet, while taking the 21st place out of 63 athletes in U17 and 117th in total of 232 sailors in U19 in the World Championship Laser Radial youth held in Dublin in July 2016. In the Radial Youth Europeans Championships & Trophy 2016 staged in Tallinn Estonia, between the 9th and 14th of August 2016 he was placed fourth in the U17 out of 47 participants and he managed to enter the gold fleet, placing himself 18th overall (U19), with 138 participants.